A weekly newspaper is set for its first change of editor for 25 years as the current head of content prepares to step up top the role. Judi Kisiel is bowing out next month as editor of the Archant-owned Weston, Worle & Somerset Mercury after a quarter of a century in the role. Her place will be taken by 38-year-old Simon Angear, the current content editor at the title. 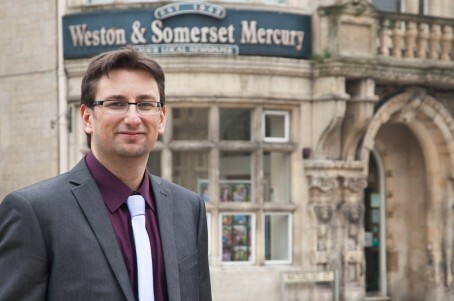 It represents the fulfilment of a long-held ambition for Weston-born Simon, pictured below, who says he has always wanted to lead his hometown paper. He said: “Having grown up in Weston, the Mercury was the first paper I ever knew, and its strength and community standing shaped my ideas of what a good newspaper can achieve. “Few people are ever lucky enough to get the job they’ve always wanted, so I’m thrilled to be given a chance in a role which means so much to me. “I’m enormously grateful to Judi for all the support and guidance she has offered me throughout my time with Archant. Father-of-two Simon began his career on the Weston & Worle News in 1999, before joining Raymond’s Press Agency in Leicester in 2001. He became news editor of Newsquest weekly the Bridgwater Mercury in 2003, and spent five years there before joining Archant in 2008. Archant Lifestyle Regional MD, Tim Thurston, said: “I am delighted with Simon’s appointment, he is a Weston man and has demonstrated in his role as content editor that he has the attributes to be an excellent editor. “Having benefited from working with Judi for many years he knows the town, the paper and what makes a good news story. “I would also like to pay tribute to Judi, who has had a remarkable career with Archant and has produced some of the finest papers ever seen in the South West. During Judi’s tenure the Weston Mercury has won many awards and is one of the most renowned weekly papers in the country. Those days at the Gosport Standard seem a long time ago, Judi. Every good wish in your retirement.